f your internet habits only extend as far as checking Facebook or Googling recipes, then you might not have heard of the Streisand Effect. Coined back in 2005, the term refers to an incident where Barbara Streisand tried to remove a picture of her Malibu home from the internet. Rather than achieving it, the exact opposite occurred and it generated way more interest and publicity – and thus was the birth of the phenomenon known as the Streisand Effect. The internet is a crazy beast. Everybody talks about making something go ‘viral’. The money or exposure that can be made from something going viral is insane. Just a few weeks ago, a video of a woman in America who bought herself a Chewbacca mask racked up over 100 million views in a couple of days and completely changed her life. Money and endorsements flowed in from various companies, she appeared on numerous TV shows, including The Late Late Show with James Corden where she met Star Wars director, JJ Abrahams, and most recently got to meet with Peter Mayhew (the guy who actually played Chewbacca). But this sort of viral publicity that we talk about is positive; it’s the type that people and companies strive to achieve. But on the flip-side of something going viral and being positive, is where the Streisand Effect comes in. Where you actively try to suppress some sort of information and in turn by doing so, you generate more interest in it. Way more than you would ever previously have imagined. The image Streisand had tried to censor was an aerial shot from a collection of 12,000, showing the Californian coastline. Before she made the request to remove it, the image had been downloaded only six times, two of which were by Streisand’s own attorneys. The month after the case went public, it had been viewed over 400,000 times. Unfortunately, the Streisand Effect doesn’t just affect individuals. Some companies haven’t realised, or more than likely just underestimated, it’s power. In 2014 a guesthouse in New York tried to suppress negative reviews they were receiving on Yelp, by fining people $500. The fine was deducted from their deposit or the credit card they had on file, but worse still, it not only applied to just the individual who posted the review. If you were having a wedding at the venue, your wedding guests were also not permitted to post a negative review and should they do so, you were liable for their actions! Needless to say, when this story went public they received thousands of negative reviews, no only on Yelp, but other review sites. People who hadn’t ever stayed at the guesthouse or had even heard of it before that day were posting their reviews and opinions. The guesthouse later claimed that the suggestion they would fine people $500 was ‘just a joke’ – unfortunately the damage was already done. Whether an individual or a company, the simple fact with the internet is to just roll with it. 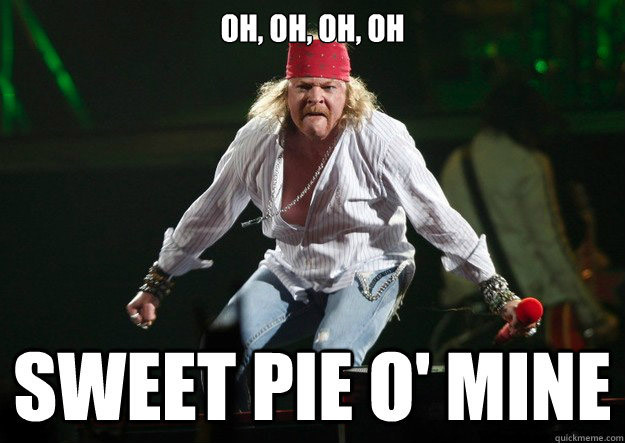 As an individual like Axl Rose, as much as the picture is unflattering and he has since lost weight, the best thing is to just to ignore it, or go along with the joke. Everybody knows that when someone is making fun of you, the more you show it affects you; the more they will do it. We teach our kids not to let things faze them, so as adults we need to try and do the same. For companies, it’s all about damage control. If you receive a negative review, apologise and try to fix the problems so that you don’t get further negative reviews. It’s that simple. It doesn’t matter what industry you are in, be nice and be courteous to your customers and try to help fix the problem. Don’t try fining them like the NY guesthouse. Don’t try blackmailing them, like Samsung tried to do in 2013 when a Youtube user uploaded a video showing his Samsung phone battery bursting into flames and certainly don’t try suing them like a Boston moving company tried to do in 2012 when someone posted a negative review about them. Just roll with it!